Every year has its own distinct personality, and 2009 was certainly no different. We all experienced things as various groups; as a family, a city, a country, and as a world. Of course what we contribute individually helps determine the outcome of each group we're a part of, so it's important to look at how our personal responsibility affects ourself, and it turn, others. 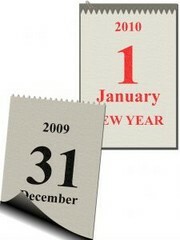 Using the end of the year as a marker, take a minute to review how you feel you did in 2009: 1. What did you learn about yourself this past year? Were there things that surprised you about your own behavior? Do you have any regrets or things you wish you'd done differently? How would you change things if you could? 2. Are you where you wanted/expected to be relationship and dating-wise at the beginning of this year? Did you spend enough focused time on your dating life to get positive results? Did you try new ways of meeting people or did you end up doing many of the same things as last year? 3. Do you feel fulfilled by your overall social life? Did you spend enough time with other single people? 4. Has your friend circle expanded or contracted? Did the people you spent time with make you feel good about yourself, or did you end up feeling like you gave more than you received within those relationships? 5. Did you work on getting rid of old relationship baggage? Do you feel there are issues you still haven't worked out when it comes to past relationships? 6. Did you challenge yourself in your life and your personal growth? What did you accomplish this past year that you can say you're proud of? 7. Do you feel good about how far you've come in 2009? Remember that you can make a change at any time in your life, and to be proud of how far you've come!